Argyle Feed and Hardware is proud to serve North Texas and the surrounding communities with a great selection of horse supplies and horse feeds. If you are raising horses in North Texas, then you have simply got to come check out our great selection of feeds. 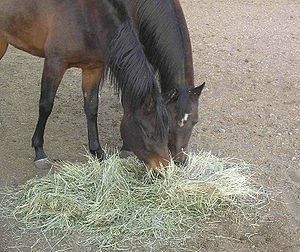 We offer feeds from the top brands including Purina Mills and Thrive Horse Feeds. Whether you are looking to feed an elite equine athlete or a geriatric horse, Argyle Feed and Hardware has the horse feeds you need. If you are in North Texas, then come by our feed store today and our staff will be happy to set you up with the perfect feed for you and your horse. If you are interested in the feeds that we offer at our North Texas feed store, then please click here to view our selection. Here at Argyle Feed and Hardware, we are committed to making sure you find exactly what you are looking for. If you have any questions about the horse feeds and supplies that we offer, then please click here to visit our contact page. We will be more than happy to answer any questions you may have.